It is the best place where to submit, view and manage your support and sales tickets. A CDN account and a helpdesk account are two different accounts. To create a helpdesk account just send an email to our helpdesk Technical Department (support@cdnsun.com) or Sales Department (sales@cdnsun.com) and your helpdesk account will be automatically created. 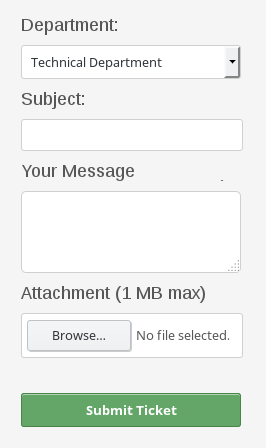 To avoid SPAM filtering it is recommended to send your email using the contact form in our CDN dashboard, see below. When we receive your email then your helpdesk account will be automatically created and your access credentials will be sent back to you. Please note that you don't need to request creation of helpdesk account, just submit your technical or sales ticket and your helpdesk account will be created automatically. 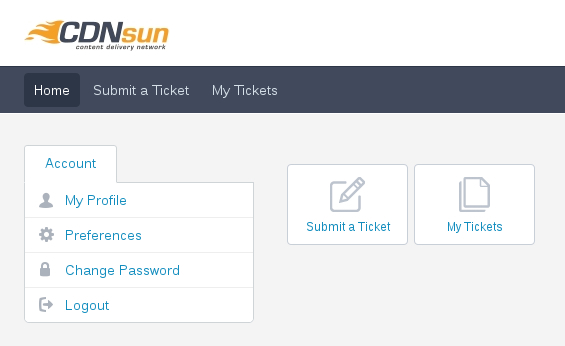 When you have a helpdesk account then log in to it and submit, view and manage your support and sales tickets. Log in to our helpdesk at https://helpdesk.cdnsun.com. To reset your helpdesk password visit this page. When you are logged in to our CDN dashboard then the contact form is sending emails to our helpdesk as from your primary email address. Moreover when you select the Technical Department then a CC is sent to all your technical contacts and when you select the Sales Department then a CC is sent to all your billing contacts.